Thai Meethu Sathyam was released on 1978 Deepvalai (30.10.1978). Two more Rajini films were released together with Thai Meethu Sathyam and they were Thappu Thalangal and Aval Appadithaan. 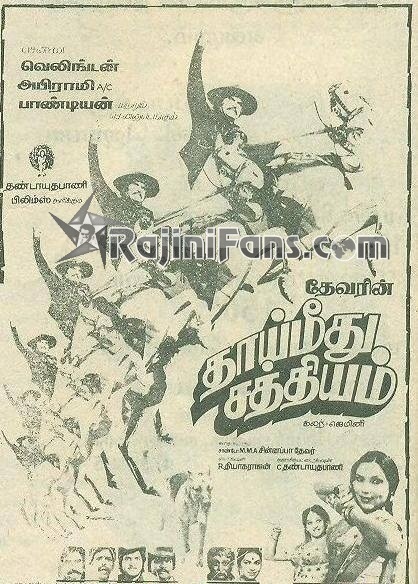 At Chennai, Thai Meethu Sathyam was released at Welington, Abirami and Pandiyan as a regular shows at all theaters. This was a typical cowboy style movie and Rajini managed to increase his fan base through this movie. This film was produced by Devar Films (MMA Chinnappa Devar) and it was considered as a big budget movie during that time. Earlier, Devar refused to finance Rajini movies? Then, how come he produced this film? Bairavi was produced and directed by Kalaignanam. Initially, Devar agreed to give financial support for this film but when he heard that Rajini is the hero of the movie, he withdraw the support and advised Kalaignanam to stop the movie or change the hero. Devar informed that Rajini is only fit for villain and not for hero. How dare you chose a existing villain as a hero and hero as villain (Srikanth was acting hero those days) and he assured to Kalaignanam that it will be a big loss. With all these burden, Kalaignanam decided to produce this movie with our Rajini as a hero. When the film was released, Devar watched this film in Rajakumari Theater. He was quite shocked to see the response for Rajini and during the interval itself the film was declared as hit. 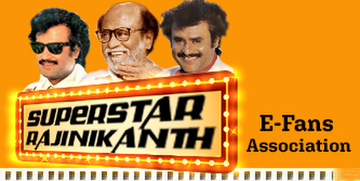 Devar withdrew all the words and asked Kalaignanam to book Rajini for their banner. Followed by that, Kalaignanam came along with Rajini to see Devar and he appreciated Rajini's performance immediately. Devar booked Rajini for 2 films consecutively and they are Thai Meethu Sathyam and Annai Oor Alayam. He gave Rs.1.50 lakhs as fee for both movies. The above experience was shared by Kalaignanam in RAJ TV on the eve of our Superstar�s 2005 birthday.